Planted in the 1700s, the gardens of Pitney Farm are registered in the Archives of American Gardens at the Smithsonian Institution and have won numerous horticultural awards over the years. The oldest surviving landscaping on the property is the 250-year-old Allée, comprised of a double row of mature maple trees running on either side of the homestead’s original entrance from Cold Hill Road. These trees were planted as young saplings in the 1760s, when New Jersey was still a colony of the English crown. 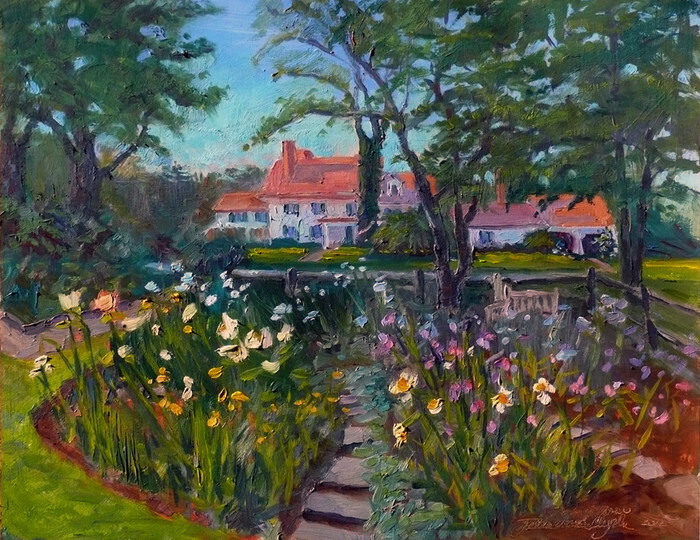 Edward Kranich’s 1854 painting shows a fenced garden directly in front of the residence. The fenced area includes four quadrants and an arbor that runs north-south on a direct axis with the main entrance to the home. One hundred and sixty-one years later, this garden space remains relatively unchanged, and today it serves as a cutting garden. During the 1930s, a gazebo and brick walled garden were added on the west side of the property, and planted with specimen shrubs and a foundation taken from the Pitney’s Morristown home. The current Pitney gardens bear the imprint of Kathleen (Mrs. James Duncan) Pitney who further developed this very American-style garden. The gardens are included in the Archives of American Gardens at the Smithsonian Institution in Washington, DC. With its pre-Revolutionary Allee, three fruit orchards, and numerous specimen tree and shrub plantings, Pitney Farm is an important arboretum property as well as an American-style garden.